How does an American Shorthair look? The American Shorthair is a sturdily built cat with an athletic body. Not big, not too small, not too long, not too short, they are just right. They have a short snappy hard coat and deep expressive eyes. 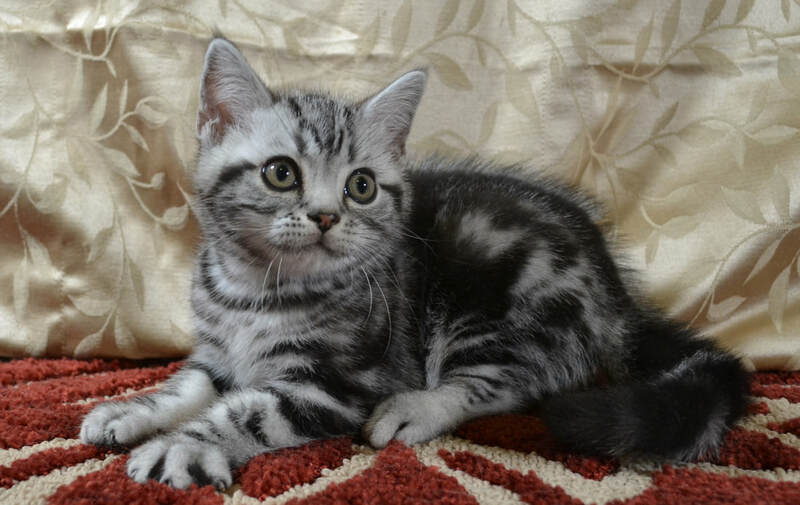 American Shorthair come in many colors, but we prefer the striking silver tabby pattern. Many people think of this breed as the perfect balance for a playful, loving house cat. What is the personality of an American Shorthair? Do American Shorthairs require special care or grooming? American Shorthair are very low maintenance cats. They typically groom themselves, but they do enjoy being brushed or combed to help remove any loose hairs. They rarely require bathing. The American Shorthair was recognized by CFA in 1906, but their ancestry goes much farther back. They were believed to have been brought here by early settlers to help control the rats and mice on the ships.